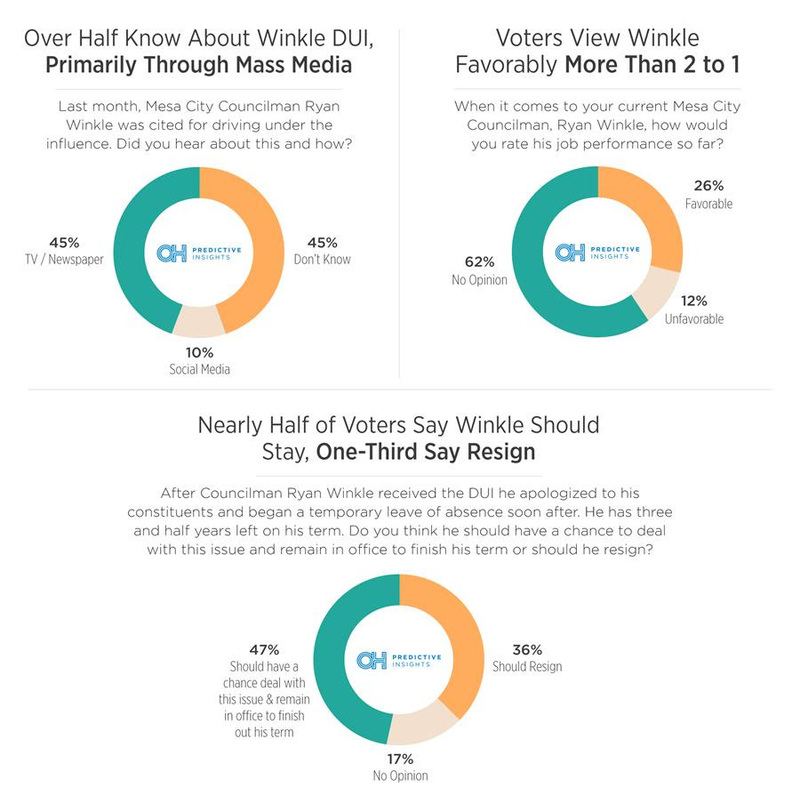 (Phoenix, AZ) – The Public Integrity Alliance recently commissioned two polls, both conducted by Data Orbital that shows Mesa Councilman Ryan Winkle largely favored to resign after second super extreme DUI arrest. Councilman Winkle, in his first time on the Mesa City Council, has faced recent scrutiny after an arrest in Tempe where he allegedly nearly hit pedestrians while swerving. Data Orbital, a Phoenix based consulting firm, announced today the results of two surveys that asked Mesa residents city wide and specifically residents of Mesa District 3 (the district Mr. Winkle represents) their knowledge of the recent arrest and if the DUI was merit enough for him to be removed or asked to resign by the Mesa City Council. 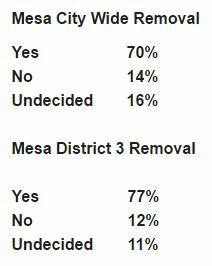 The poll results, that were taken city wide and specifically in his home district Mesa 3, showed that 70% of people favored his removal/resignation while only 14% thought he should not be removed. Also, a little more than 40% of people were aware that this was his second DUI arrest. Survey One: IVR poll of 800 registered voters in the city of Mesa has a margin of error at plus or minus 3.5 percent, with a 95 percent confidence interval. Respondents were weighted on a number of different demographic figures based off an Arizona registered voter file and responses were collected from automated landline surveys over three days. City Wide Toplines. Survey Two: Live & IVR mix poll of 300 registered voters in Mesa City Council District 3 has a margin of error at plus or minus 5.7 percent, with a 95 percent confidence interval. Respondents were weighted on a number of different demographic figures based off an Arizona registered voter file and responses were collected from live cell phone and automated land line surveys over three days. Mesa District 3 Toplines. Phoenix, AZ (June 22, 2017) – Arizona is never short of hot political issues or debates, and typically a City Council position gets little to no attention – that is until now. There have been ongoing conversations about whether Mesa City Councilman Ryan Winkle, District 3 should resign from office or remain in his position, following his May arrest on suspicion of DUI. We asked the voters of his district their opinions, and if they believe the Councilman of six months should resign or stay. Nationally recognized polling firm, OH Predictive Insights, conducted a survey comprised of 304 currently registered Democratic, Republican, Independent and Non-Declared voters registered in Mesa’s 3rd City Council District. The survey was conducted from June 8th to June 19th, with 49% of the sample contacted on their cellular phones, and 51% of the voters reached via landlines. Methodology: This live and automated caller survey was conducted by Phoenix based-OH Predictive Insights from June 8th to June 19th, 2017, from an active registered voter sample in Mesa City Council District 3. The sample size was 304 completed surveys, with a MoE of +/-5.61%. 49% of surveys were conducted on cell phones and 51% via land lines. View the press release online. Four years ago I announced my bid to run for Mesa City Council District 6. What a ride it has been! My passion is serving the community, and I am grateful for the trust the citizens of Southeast Mesa continue to place in me. Without a doubt it is the most challenging and rewarding job I’ve ever had. Today, I proudly announce that I am seeking re-election for another four-year term to represent the voters of District 6. We’ve accomplished a lot during the past three years, particularly in the areas of economic development. When I first ran for office, I promised to focus on working to bring quality jobs to Mesa. I can’t take credit for all of the growth we’ve experienced, but I continued the vision that was set in place before me, and I’ve challenged the departments within our City to do it better, more efficiently, and more effectively than anyone else. You can’t say you’re open for business if your actions don’t show it. We’ve instilled confidence in the business community and the development community, and our district continues to shine as a model for the entire City. In just three short years since I’ve entered office, Chandler-Gilbert Community College expanded their campus at Mesa Gateway, Gateway Polytechnic was built at Bella Via, and Eastmark has become the fastest growing community in Arizona. Apple announced their Global Command Center with a $2 billion dollar investment, Dignity Health constructed a new hospital, DuPont Fabros announced plans for a giant data center campus, Niagra Bottling is bringing 50 jobs along with a $76 million dollar investment, and EuroContempo is bringing jobs and a $10 million dollar investment to Ray Road. We’ve also seen incredible growth in our industrial sector including an expansion of CMC Steel, a new facility from Matheson Tri Gas, an expansion from Fuji at their Pecos plant, and a new Metso repair facility. Not to mention we are now home to the largest Fry’s Marketplace in Arizona, a new Courtyard Marriott, and scores of new restaurants. All of this growth however, does not mean I will serve as a rubber stamp. I continue to ask questions to insure our tax dollars are spent in a fiscally responsible manner and challenge proposals that do not have taxpayers best interests in mind. How much does it cost? Where is the money coming from? Who benefits? Are there alternatives? I will continue to ask these questions because I owe it to you and I owe it to my family. After all, like you, I’m still a resident and taxpayer of Mesa. Regardless of whether you voted for me before, I’m hopeful that, over the past three years, I’ve instilled your trust and gained your confidence. There’s a lot left that I want us to accomplish as a District and a City, and I would greatly appreciate your support. Vote “Thompson” for Mesa in 2018. Winkle for Mesa … In Tempe? You would think that when you’re running for a local office that you would hold your events in the district, right? Apparently, Ryan Winkle who is running for Mesa City Council in District 3 would disagree! Winkle is hosting an event that he’s calling a “Community Celebration,” in Tempe. Is that a slap in the face to the voters in Mesa’s 3rd District? We think so… That is the equivalent of someone running for the Phoenix City Council who campaigns in San Tan Valley. It just does not make sense! Maybe he’s confused about what district and city he is actually going to represent? Winkle, we know you’re young and naive, but if you’re running to represent people then please run in the district you’re aiming to represent. You are not running for Tempe City Council. The people of Mesa deserve better and deserve to know that you care about them and the issues facing the community. Evidently, you do not. This brief study of the City of Mesa FY2014/15 Budget has been compiled by Mesa resident Gene Dufoe. Mr. Dufoe is a retired Boeing engineer/manager who possesses the following degrees: BSAE, MSAE, and an MBA with an emphasis in Finance. He is a Precinct Committeeman in LD25. 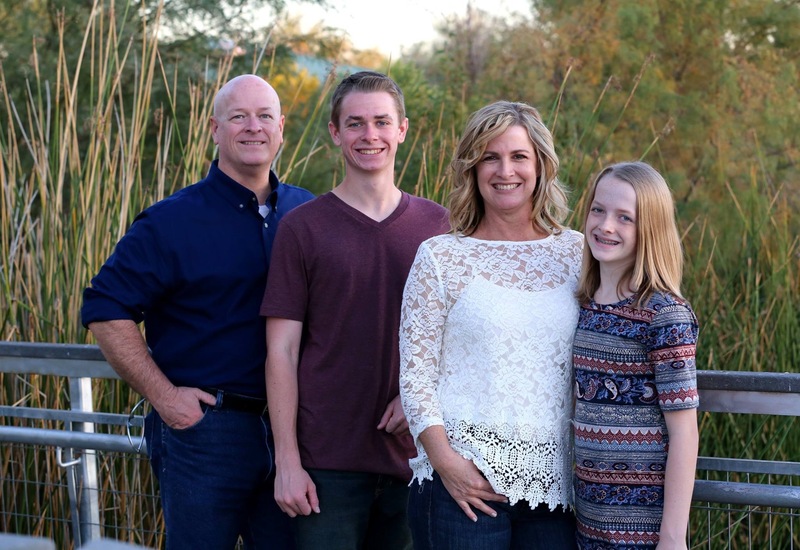 Dufoe supports Danny Ray for Mayor of Mesa, Dr. Ralph Heap for the LD25 Senate seat presently held by Bob Worsley, and Diane Douglas for Arizona Superintendent of Public Instruction. The scheduled interest to be paid through 2037/38 is $302,539,619 for only the General Obligation Bonds issued during Scott Smith’s administration. This is nearly three times greater than was paid on the General Obligation Bonds issued under the previous administrations. The comparison of the Utility Revenue Bonds is even worse, $71,360,274 vs. $327,537,942, or 4.6 times greater. The reason that the interest scheduled was so much higher during Mayor Smith’s years in office is that both the length of the bonds were extended, and the payment of principal was also substantially delayed until the last years of the bond life. For example, under the previous mayor, $11,705,000 2005 General Obligation Bond life was 18 years and the total interest scheduled was $4,128,700 or Total Interest Paid/Principal Repaid = 36.9%. However, that is NOT the worst. The Utility Revenue Bonds which are paid by the City of Mesa residents through the Secondary Property Tax and the monthly utility bills are managed by the City of Mesa’s business portion, called Enterprise Fund. The Enterprise Fund transferred $173,606,136 to other current obligations of the city, per the City of Mesa Summary of Estimated Revenues and Expenditures, FY2014/15. Exceeding by less than 5% – penalty will equal to amount of the excess. Exceeding by more than 5%, but less than 10% – penalty will be three times the excess. Exceeding by more than 10% – penalty will be five times the excess or 1/3 of the state income tax allocation, whichever is less. If the State limitation has been exceeded by more than 10%, the expected penalty to apply to FY2014/15 would be $17.7M (based on one-third of the FY2014/15 state-shared revenue). 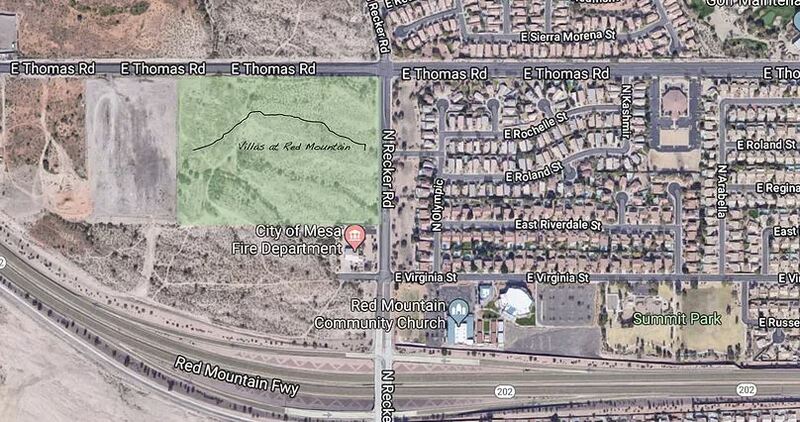 What was the bond rating for the City of Mesa Bonds – Various Purpose bonds when issued? When are the bond annual bond principal installments being redeemed and at what interest rate? 8. Have any of the overlapping jurisdictions informed the City of Mesa that they were in danger of not meeting their bonded debt obligations under the “Direct and Overlapping General Obligation Bonded Debt Outstanding” category? No. General Obligation and Utility System forecasted issuances are attached. (SeeAuthorized Bonds – Issuance Forecast.) There are currently no plans to issue Street and Highway User Revenue or Excise Tax bonds. At a time when millions of Arizonans have struggled to make ends meet through the Great Recession, there’s one gubernatorial candidate who’s been indifferent to the plight of his paycheck-to-paycheck neighbors. Former mayor of Mesa Scott Smith, whose net worth still remains undisclosed (although we know it’s well over $100K), pushed hard twice while mayor of Mesa to increase his pay and the pay of his fellow council members. Prior to the increase, the charter for the city of Mesa locked in the mayor’s compensation at $33,600/year with a $1,800/year vehicle allowance and $960/year phone allowance. To change that compensation, the mayor and council are required to vote rather than send the issue to voters. Smith made the first push to increase his salary on December 10, 2012 during a regular session of the mayor and council. In the video, Smith argues for increasing his pay and not to reject the recommendations of an independent commission. During that first attempt, he asks the council to support him for the 118% pay raise and allowance increase of 122%. As the video shows, Smith’s temperament reveals a man on a mission to make more money as mayor. If you haven’t worked out the math yet, the 118% pay raise would take the mayor’s salary to $73,300/year and the vehicle allowance to $6,600/year. Keep in mind, this is for a part-time mayor and council. During the first attempt, the vote fails with Smith visibly upset that the council turned down his request. One year later, On December 9, 2013, Smith makes the push to hike his salary once again using the same commission recommendations. He chides the council, “it was right a year ago and it’s right now.” This time Smith is successful in pressuring the council to raise his and their pay. The Mesa Charter is amended with the new and outrageous increases but what the average citizen never sees (unless they watch the December 9, 2013 video) is that the mayor and council also voted to make themselves eligible for benefits “consistent with those provided to executive level City employees.” So now in addition to the pay raise, Mesa’s mayor and council are now receiving the same benefits as senior city management. One comment that sticks out during the debate, is that Smith notes that Mesa is the 38th largest city in the country and its mayor and council deserve to be compensated as such. Given Mesa’s population is ranked between Tucson and Chandler, we reviewed their compensation rates to see if Mesa ball parked itself proportionally on elected official compensation rates. Tucson, which is the second largest city in Arizona, compensates its mayor at $42,000/year. Chandler, ranked as the fourth largest city, pays its top elected executive $49,500/year. Mesa ranked third, is well above the Arizona cities above and below it by $23,800. But we also took it a step further and looked at Mesa in terms of its population ranking among other US cities. Just above Mesa is Kansas City, Missouri which pays its mayor $123,156/year. Right below Mesa, is Virginia Beach whose mayor makes $10,000/year. Quite a variation but more like comparing apples to oranges. Finally, we reviewed 2012 US Census data to see what the average median income is for the city of Mesa. According to this latest data, the average family in Mesa earns $47,256/year. For the mayor of Mesa to relentlessly push for a dramatic pay raise during a time when many Mesa citizens remain in financial hardship due to reductions in salaries, hours or even job loss, anyone can see that Smith’s crusade to raise the mayor and council’s salary was not the right thing to do. Arizona voters are worried that this style of governance will be more of the same business-as-usual. Conservatives reformers are trying to put an end to runaway spending, backroom union deals and corporate cronyism. Scott Smith’s style of management proves he’ll push the former and disturbingly his own self-interest no matter what it cost the citizens he’s supposed to serve.